If you have your sights set on getting your horse to the upper levels, you know that you aren’t going to get there by riding sloppy transitions. You are going to get an upper-level horse by riding high-quality, detail-oriented, effective transitions. In other words, upper-level transitions. But even if you feel as though your ambitions are more modest, I know you don’t want to spend all of your riding years without ever experiencing the ineffable feeling of a horse who is balanced, engaged, lighter in front, and (dare I say it) collected. Paying attention to your practice of transitions is going to pay you dividends by properly developing the way in which your horse uses his body, and therefore the feeling that he can give you when you ride him. At its most basic, a transition is a change. It could be from one gait to another (e.g., walk to trot, or trot to walk), within a gait (e.g., from working trot to a more ground-covering trot), or a change that skips a gait (e.g., walk to canter, or trot to halt). Let’s look at some of the benefits of transitions, and how to achieve them with your own horse. In nature, the horse has about 60% of his weight on his front end, 40% on the hind. Adding a rider places even more weight towards the front of the horse, which is not necessarily conducive to his long-term soundness. So to preserve the health and useful longevity of the riding horse, as well as make him more handy and maneuverable while he’s being ridden, the goal of training is to develop his balance towards a more 50-50 split between hind and front end. At the ultimate level, training seeks to develop the horse’s physique such that he is able to carry more weight behind than in front. To illustrate this ideal, picture a High School Lipizzaner and rider as they demonstrates the levade, standing balanced on the hind legs, hock joints deeply flexed, powerful hind muscles bulging and abdominals engaged, as the front end neatly levitates above the ground for what-seems-like ever! 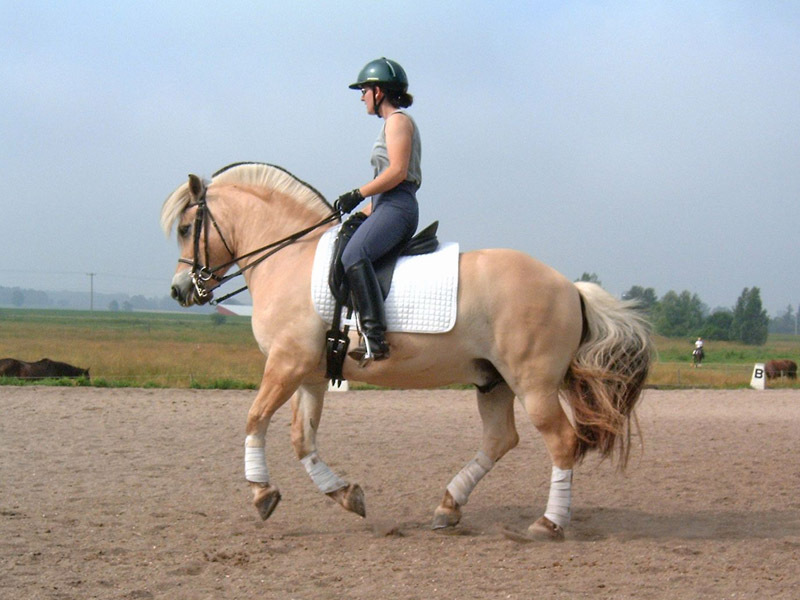 To train the horse to have his balance more and more towards the rear, we are going to use the down transition. Here’s our visual. 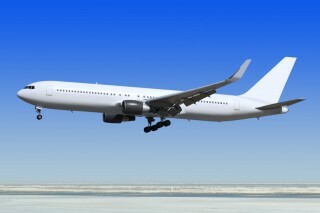 Picture an airliner coming in for a landing. As the pilot brings the plane down through the air over the runway, he is going to gradually lower his airspeed, adding just enough energy as necessary to keep the nose of the plane up, while he gets progressively slower and slower until the rear wheels touch the tarmac and then the nose wheel gently follows suit. That’s how you want to ride it with your horse. You don’t want to get over the runway and think OK I want to stop NOW, suddenly cut all speed, and plow the nose down into the pavement. As you ask your horse to transition down, you want to have the feeling that at any instant you could change your mind and ask him to immediately surge forward instead, and that it would be easy for him to do. So you want him to come back while still maintaining a forward feeling and staying active with his hind legs. This is just like our pilot in the metaphor, who has to be ready at any moment to pull up and go around if for any reason the runway is no longer clear for his landing. To keep this ready-to-go feeling in your down transition from trot to walk, you can even think “hind legs trotting, front legs walking”. A horse can’t actually do that, of course, but it gives you an image of how active you want his hind legs to stay until the penultimate moment. As you ask your horse to make a down transition in this way, he will begin to flex the joints of his hind legs a little more and slightly lower his hind end. Over time, you will begin to feel a bouncy, dancing feeling as this energy moves freely up through his back. This work is what will build up the muscles of his hind end, his back, and his entire top-line. Don’t underestimate how effective this simple work can be. I remember years ago I got a mare in for training. She came with a laundry list of problems, including the unappealing news that two separate trainers refused to get on her anymore due to her frequent habit of spooking and scooting. Apparently this behaviour was keeping the trainers’ chiropractor well employed with putting their backs back into place. The owner thought the horse had weak stifles which was causing her intermittent discomfort, which resulted in her scooting off. I started over at the beginning, and after a getting-to-know-you period reported to the owner that I was working on riding lots and lots (and lots!) of correct trot-walk-trot transitions with her. “Oh, she hates those!”, the owner told me. I had to laugh. “Well, that’s why it’s exactly what she needs to do,” I replied. After a short six weeks, she was a totally different horse. Her hind end was muscling up in the right way, her stifles were fine, we could get rid of her “corrective” shoeing, and she was steady and focused on her rider. When I sent a video, the owner cried tears of joy to see her horse being so cooperative and looking so happy in her work. The mare went on to be a successful show horse. I give the credit to the strengthening power of the humble transition. Ideally, you want the horse to respond both quickly and easily to your aids to go forward and come back. 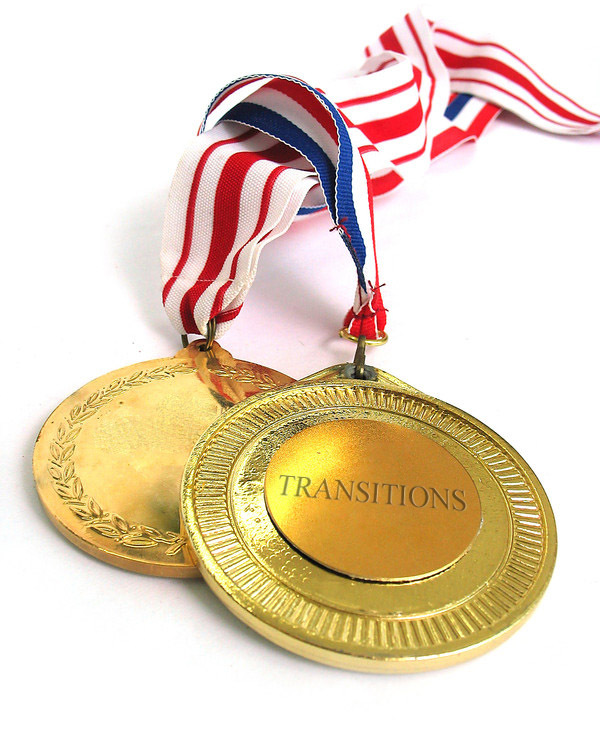 Asking for a transition will test his reaction to your aids, and give you an opportunity to improve that reaction if it is less than ideal. Don’t just cruise around, letting your horse decide what he is going to think about. By asking for frequent transitions, both between gaits and within the gait, he won’t know what is coming next so he will need to stay focused on you. An exercise I like (especially useful for a horse who wants to tune me out) is to ride a transition every 5 strides. Five is a fairly small number and you might be astonished at how quickly it comes up, but it keeps your horse on his toes. He might be a bit surprised and act like “What!? Walk already?! You just told me to trot!” That’s OK, just praise him verbally every time the transition is good so he knows that he is pleasing you, and he will start to get into the game, eagerly anticipating whatever is going to come next. I find that transitions between trot-canter-trot (or walk-canter-walk) every five strides improves the collected canter as it gets my horse very tuned in to my half halts, so I can become quicker and lighter with them, and he stays more tuned in to, and waits for, my seat. 1. Are you being 100% clear and black and white in your expectations? One of the hardest parts of training horses is to train ourselves as riders to be 100% honest and clear. Don’t make excuses for your horse if he is ignoring your aids to go forward or to come back. Clearly communicate exactly what your expectation is. If he doesn’t go forward easily and enthusiastically from a light leg aid, correct him immediately! Make sure he knows that was not acceptable, and then test him again with a light leg aid. Similarly if he is running through your half halts and ignoring you when you ask him to come back, then do a full halt. 2. Are you holding an image of the ideal transition in your head? By visualizing all the parts of how the transition will look and feel in advance, you know what you are intending, and are therefore much more likely to get it. By having an ideal transition in your mind you can react more quickly to fix things in real time if they aren’t going the way you envisioned. 3. Are you remembering to release after the half halt? The release is an integral part of the half halt. The goal is to have the half halts become quicker and lighter, which isn’t going to happen if you hold, hold, hold without releasing. Riding is all about how it feels, and this is particularly true for riding transitions. Since words are generally inadequate for communicating a feeling, and each horse is an individual living being without fixed buttons that will cause these feelings to come about, my goal is to give you some tips to get you thinking and pointed in the right direction. Next, you have to get out and practice with your own horse. Ride the transitions, stay aware and mindful, and notice what is effective in giving you a better feeling, and work on developing more of that. Performing proper transitions is a physical workout for the horse, so make sure to incorporate walk breaks and periods of doing other things in your session, to allow his muscles to rest. Let us all know what you discover in your practice. Share your transition stories, or any questions, in the comments! WOW, nice post. I really like the comparison of downward transitions to an airplane landing. I have one student in particular that does well with word pictures. I’ve been having a hard time coming up with the right description of the “feel” she should have in her horse on a downward transition. You nailed it! Thank you for sharing all your abundant knowledge and experiences. I look forward to your blog.